Standard-sized (6 5/8" x 10 ¼"), 24-page color comic with color covers. India ink with watercolor. Published August 2005. In June and July 2003, my love and I travelled to Lithuania, Latvia, and Estonia. All of these countries were, briefly, independent states between the World Wars, after centuries of being dominated by the Germans, Russians, and Swedes. During WWII, the Soviet Union annexed them all. They regained their independence around 1991, with the collapse of the Soviet Union. See mediaeval towers, 18th-century palaces, impoverished farms, pagan sculpture-gardens, and an old Soviet missile silo. See storks, swallows, gulls, crows, ducks, herons, robins...and a mystery bird that most of the locals we asked couldn't identify. Story and art © 2005 E. J. Barnes. Parental Guidance Advised for Readers Under 12. 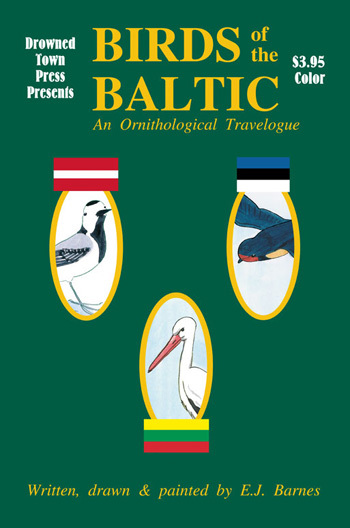 This unique peek into bird watching across the Baltic States is done in an accessible comic book format, complete with a light yet compelling narrative. ...It always amazes me when people are able to get the money together to put out a color book, especially one as gorgeous as this one.